Consisting of 1,190 tropical islands stretching from the Indian Ocean, the Maldives truly paradise for sea tourists attractions. Many beautiful attractions such as the spread of coral reefs and lagoons which large, and at least 10% over the inhabited islands. Warm and crystal clear sea water, making tourists stand for long here. With temperatures that fluctuate between 26-32 degrees celcius, the Maldives attract many foreign visitors or travelers throughout the year. The Maldives is located in the southwest of Sri Lanka near the equator. There is also an international airport located in the capital, Male, an island with a population of 75 000 inhabitants. 1190 islands form the archipelago of 26 coral atolls. Each of the atolls and lagoons facing directly into Indian Ocean. 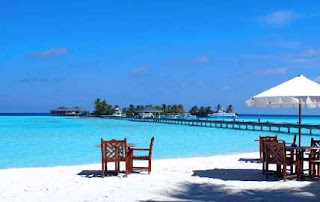 In addition to a vacation spot, the Maldives is often used to honeymoon for the newly married couples. And many facilities that support the rapid advancement of this place like a restaurant, swimming pools, sports facilities and organized activities. There is also a cafe, karaoke or disco and many other amenities that make every traveler feel at home for a long time here. 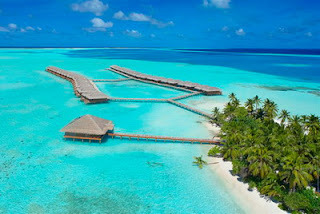 Maldives looks all the more beautiful because turquoise reefs and palm trees graced almost any landscape. You can even watch the fish swim around the reef while you wander lazily on the beach. Your children will enjoy the coral fringed beaches where they can spend hours making sand castles and collecting sea shells. For accommodation, when the tourist season coming (December-March), it is advisable to book a hotel well in advance before visiting the Maldives. 1. Scuba diving (diving). The entire resort in the Maldives have internationally certified diving facility. All equipment provided such as masks, diving equipment, until the tube is specially disedikan dive to dive. The most popular places such as Ship Wreck diving, Banana Reef, Shark Point, Barracuda Giri, and Manta Point. 3. Until now, many say only the diver really enjoyed his holiday in the Maldives. Though it is, you do not like wet sport, you can admire the beauty of the underwater coral and the fish by using German-made submarines. 4. Although still new in the Maldives, but now surfing activities began to glance by tourists, especially in the north Male Atoll. 5. Fishing. This activity could not only do the natives of the Maldives, foreign tourists began fishing craze, especially at night. Even some hotels provide lodging for fishing trips, at least once a week.